Dull tools won't get you very far. So give yourself an edge. There's no question that sharp tools are a requirement for quality work. And the tools that are most apt to dull in frequent use are chisels and planes. These tools are also the easiest ones for beginners to sharpen. Of course, saw blades of all descriptions will also dull over time. But they are more difficult to sharpen and require specialized tools and techniques not normally at the disposal of the beginner. Renewing these blades is better left to a professional sharpening service. The tools required for sharpening are pretty basic. First, and by far the most important, is the stone. For best results, we recommend man-made waterstones instead of the more familiar oil stones. Waterstones are soft and therefore cut faster. And they don't clog as easily. For both reasons, they're the logical choice for the inexperienced. These stones are available either in single grits or as combination stones of two grits, one on each side. A good stone to start with has a combination of 220- and 1000-grit surfaces. As the name implies, water is used as a lubricant on these stones. The stone must be soaked in water for about 15 minutes before you use it. And it must be kept wet while you're sharpening. The water prevents the metal filings from becoming embedded in the stone and glazing the surface. When you are done working with a stone, you should rinse it off and dry it before putting it away. If you store the stone in water, it will decompose over time. Sharpening chisel blades and plane irons requires that you hold the tool at a fixed angle while moving it across the stone. The bevel angle for chisels and plane irons can vary, but for general work a 25 degree angle is a good compromise. It is possible to work on a stone holding the tool by hand. Indeed, some experienced furniture makers take a great deal of pride in this skill. 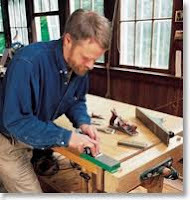 But for the beginner, it makes more sense to use a simple honing guide to keep the tool at the proper angle. The guide we show is manufactured by Veritas Tools and is available from Lee Valley and other mail-order tool companies. It comes with a companion angle guide that makes setting the bevel a breeze. One of the best features of this guide is that it rides directly on the stone, allowing you to move from stone to stone without readjusting the guide. It also has a fine adjustment for honing a secondary, micro-bevel on the tool edge that's 1 or 2 degrees steeper than the primary bevel. Because you're taking off less material on the micro-bevel, it's easier and faster to renew the cutting edge when it gets dull. Be aware that sharpening can be a messy procedure. The process creates a slurry that must be wiped off the tool often to let you check your progress. It's a good idea to place a piece of scrap plywood or rubber under the stone to ontain the mess. Sharpening a chisel or plane iron begins with flattening the back of the blade. This side of thetool is rarely flat when it comes from the factory. But flatness is crucial if you want to achieve a razor-sharp edge. Just place the blade flat on the 220-grit side and repeatedly rub the blade across the stone. Try to cover the entire surface with your strokes, to maintain even wear on the stone. Continue until you see even scratches across the entire blade surface. Then repeat the process on the 1000-grit side. Next, carefully examine the edge of the blade. If it's extremely worn, start sharpening on the 220-grit side. If the blade just needs a little touching up, you can use the 1000-grit stone. 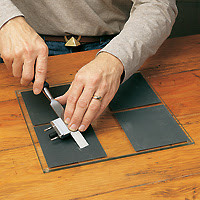 With your fingertips, place light pressure near the blade's edge and stroke the blade back and forth over the stone. Once again, be sure to use the whole surface of the stone so that the wear is not confined to one area. And be sure to keep the stone soaked with water while you work. Continue until you see a small burr on the back of the blade. This burr is sometimes called a wire edge, and it indicates that you are ready to move onto a finer grit. If you started with the coarse stone, move to the 1000-grit stone and follow the same procedure as before. When you're done with the bevel, remove the edge burr by lightly rubbing the back of the blade on the stone. Be sure to keep the blade flat. When you're satisfied with the edge, dry off the tool completely. If you want to hone a secondary bevel on the edge, simply adjust the honing guide–by turning its spring-loaded knob–for an angle that is 1 or 2 degrees steeper than the primary bevel. Move across the stone as before until you achieve a good edge like the one shown on the chisel page. This secondary edge should extend back about 1/16 in. from the tip of the tool. Use the same techniques to sharpen a plane iron. Flattening The Stone As mentioned earlier, waterstones work well because they are soft. As a result, their surfaces wear quickly, which means that new cutting material is exposed almost continuously. Unfortunately, this softness does make them susceptible to gouging and uneven wear. Occasionally, you will have to flatten a stone to keep it performing well. The way the author has described the sharpening process of a wood by using water stone is amazing. No wonder most of the people reading this blog would be surprised to know of this process. This skill requires keen expertise that only a few can manage. Moreover, sharpening wood is a very messy job and requires patience. 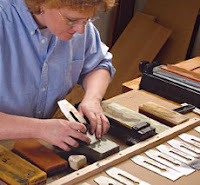 If someone wants to learn about sharpening wood by using water stone, then he can gain considerable insights into the process by following the author's post. However, you must remember to use man-made water stones instead of oil stones.